When sustainably farmed, lobsters are a delicious and highly nutritious meal. Spring is the time to experiment with new, fresh recipes and bold flavours - so fill up your plate and satisfy your hunger with these delicious recipes! Before we start it is important to know how to properly boil your lobster. Ingredients: 6 tbsp. of salt to each gallon of water. Directions: Once water in large stew pan is boiled with salt proportion above, add lobster in. Let small lobster boil for 20-30 mins and medium-large lobster boil for 30-40 mins. Note: If the lobster boils too long the meat will become thready and if not cooked enough the lobsters spawn will not be red. 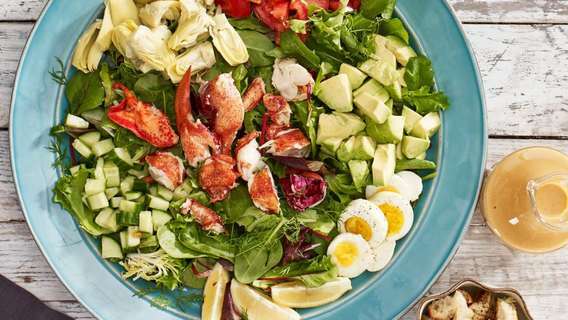 Ingredients: 1 lobster, lettuce (of your choice), endive, chopped beetroot, 2 hard-boiled eggs and cucumber. For Salad Dressing: Equal parts oil and vinegar, 1tsp mustard, 2 egg yolks, cayenne and salt to taste, 3 tsp of anchovy sauce. These ingredients should make for a smooth and creamy-looking dressing. Directions: Wash salad thoroughly and dry with cloth. Cut up lettuce and endive and mix in bowl with salad dressing. Once the boiled lobster has cooled down, pick apart the meat from the shell and cut the meat into nice square pieces. Put half of the lobster meat in the salad and set the other half aside for garnishing. Separate the yolks from the whites of 2 hard-boiled eggs and chop up the whites finely. Garnish the salad with sliced cucumbers, the remaining lobster, egg whites and beetroot. Optional: For bonus presentation points add crayfish as an additional garnish. Ingredients: 1 lobster, 2 onions, 2 tbsp. of butter, 1 tbsp. of curry-powder, 1 cup of stock, juice of ½ a lemon. Directions: Pick the meat of the boiled lobster (once cooled) and cut into squared pieces. Fry onions in butter until golden brown. Add the curry-powder, stock and lobster into onions and let thicken. Stew for ½ hour, stirring occasionally. Before serving, add lemon juice. Serve with white rice. Ingredients: 1 large lobster, 2 tbsp. of butter, ½ tbsp. of salt, pounded mace (if available to you), grated nutmeg, cayenne, whiter pepper to taste, 1 egg, and bread crumbs. Directions: Pick the meat from the cooled boiled lobster and pound in mortar with butter (or place in Ziploc bag and pound with a meat tenderizer). Gradually add mace, nutmeg, cayenne and white pepper and continue to mix ingredients until beat into a smooth paste. Divide the mixture into equal sizes and shape-like cutlets. Brush cutlets with egg wash, sprinkle with breadcrumbs and fry them in pan until a nice golden brown. At CSF, we take lobsters in the post-larval phase from the ocean and raise them on land. By raising these lobsters that otherwise likely would not have survived, we are able to support lobster populations and also support local fishing communities. We keep our lobsters in safe, controlled environments so we can ensure they are healthy for consumption, and always delicious! Could grape by-product be the next big aquaculture feed ingredient?